Listen, fellow Ohioans. I love you, but can you ease up on all the bizarre, tacky usage of animal-related stuff? A fancy winter coat or a glorified robe? I'm still not sure, but it looked like this woman ripped the seams out of a large leopard stuffed animal & climbed inside it for her trip to CVS. 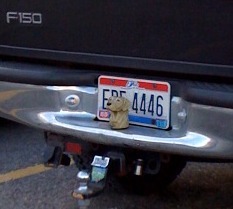 What's that atop this truck's trailer hitch in the parking lot of my local Panera? Let's get a closer look! Oh! It's a golden retriever. Naturally. And because it's Christmas, car antlers are obviously an appropriate decoration. Who needs trees & mantles when you can adorn your sedan windows with holiday cheer? Seriously, guys. Animals belong in your home & in the wild & maybe on your plate & possibly, like, in limited accessorization situations (by that I mean that I desperately want this necklace), but they do not belong in ANY of the situations pictured here. hahaha aren't you so proud to be a fellow Ohioan??? 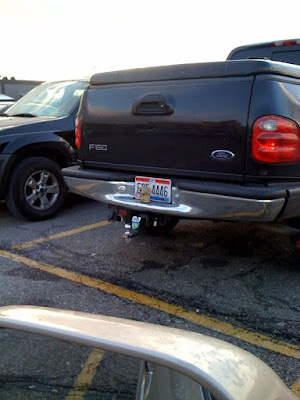 have you seen peopleofwalmart.com ? haha, I wish I had taken pictures when I was out shopping today. Your experiences pretty much summed up mine as well. Thanks for the laugh. 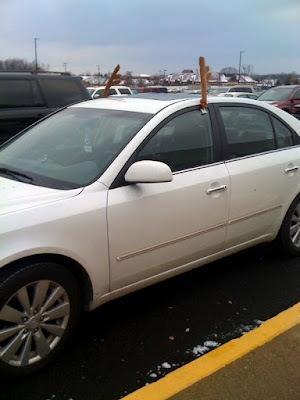 I've seen a decent amount of those car reindeer antler things here in Australia, and I thought WTF. people around here don't put nearly as much effort into decorating their houses and such... but they will put those ridiculous antlers up? Awww. The first one reminds me of my gym. These are hilarious. And sadly, I can relate. Great shots. 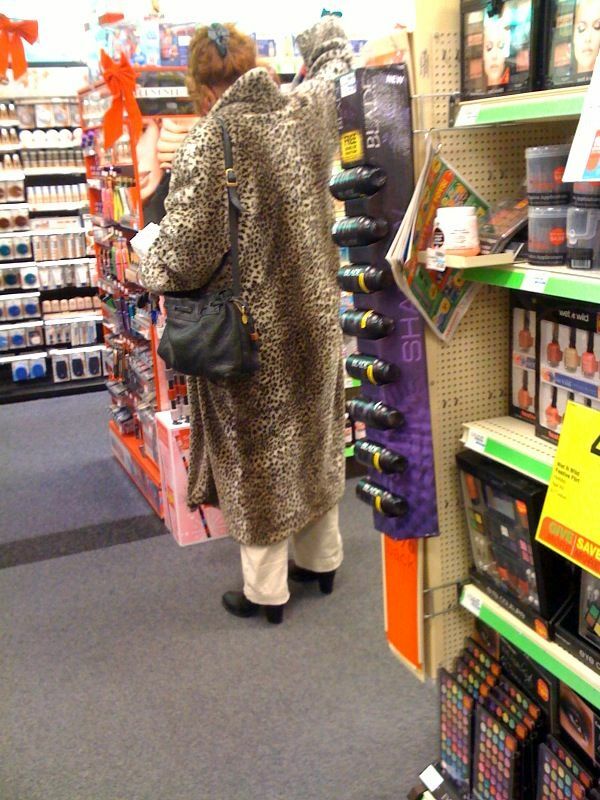 I feel like I should bring my camera every time I am in WalMart because I will undoubtedly see something like this. so i have a bone to pick with you missy! i saw yesterday that you were at the happy dog... do you know that the happy dog is like a mere few blocks away from my house?!?!? i could have run to you and not gotten tired that's how close it is!!!! let's not forge about other decorations like pine roping on top of cars. Haha, I've been dying for those car antlers because I drive 2 hours every day so why not! Sadly Walgreen's didn't have anymore when I last checked.